The Tradition of Afternoon Tea Originated Here! The Palm Court at The Langham London is famous for being the place where the tradition of afternoon tea was born. The hotel has had a complete, but sympathetic, refurbishment and reminds you of the decadent Victorian era when the hotel first opened in 1865. At this time, Victorian society gathered to enjoy the indulgent splendors of pairing tea and cake in the afternoon. Best Afternoon Tea in London. Days and Times: Daily, from 12pm midday to 7pm (5 sittings at 1.5 hours each). Cost: From £49 per person. Dress Code: Smart but not formal. Photography: Not a problem, and staff are willing to help. Music: Live piano music, both modern and classical. The original price of afternoon tea in the Palm Court in 1865 was 1/6d (now 7.5p). Everything may have gone up in price but the high level of service has remained. You enter the Palm Court through hand-crafted iron gates, into glamorous surroundings with exquisite hints of Art Deco style. The contemporary crystal chandeliers from the high ceiling are reflected in the mirrored walls. I sat in an alcove and could see myself reflected from many angles but I soon stopped noticing. The seating is mostly upholstered bucket armchairs and high-backed armchairs and there are seating options for different party sizes. Our round table had a large central base which made it difficult to sit close enough so my companion and I were perched sideways. Not all tables were like this but it did make the experience less comfortable than I had hoped. Instead of a three-tier cake stand on the table (which can often mean you can't see your companions once it arrives), The Langham has chosen an exquisite floor-standing cake stand which also has a shelf for your teapot. There are bespoke tea blends for the Palm Court and I tried both: The Langham Blend, a traditionally-styled black tea, and the signature Palm Court Blend, a more perfumed and aromatic infusion; perfect for the afternoon. It's white tea so has a light taste but has fruity overtones and is a surprising bright pink. Both are available to buy. Further teas are from Tregothnan – the only estate to produce tea grown in England. Also, a wide selection of Jing Teas are available. In total, over 30 blends are served, featuring organic, decaffeinated and herbal infusions, including pre rain Jun Shan (Imperial Mountain) silver needle yellow tea, which is rare indeed. There was not a way to remove the tea from the pot to stop it from stewing but jugs of water were left on the table. When we finished our delicate finger sandwiches, the scones were brought to the table warm and it's this attention to detail where The Langham excel. I never managed to pour my own tea as staff always seemed to know when I needed more. I certainly didn't feel as if we were being watched but staff simply work their tables very well. All staff were able to describe teas and were able to answer dietary questions about the food and this level of service from all is not always standard elsewhere. 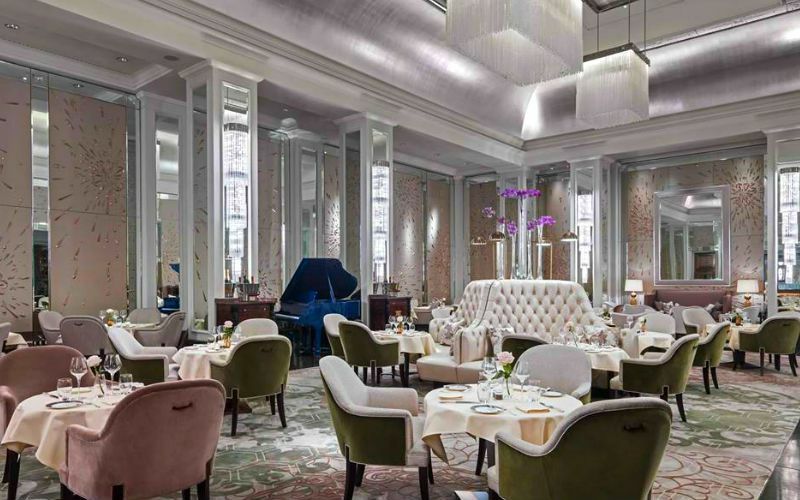 The only negatives about afternoon tea at The Langham were the slightly uncomfortable seats and table combination and the long-brewed tea, but the positives far outweigh those small concerns as the venue is stunning, the food is delicious, and the staff are impeccable. A real treat. As is common in the travel industry, the writer was provided with complimentary afternoon tea for the purpose of reviewing those services. While it has not influenced this review, About.com believes in full disclosure of all potential conflicts of interest. For more information, see our Ethics Policy.